Birmingham, AL – Knight and Hale® Game Calls, a legendary call brand known for its dedication to creating calls that produce the most life-like wildlife sounds, introduces the Echotech™ pot call striker. Changing woods, weights, and tips on strikers will change tones, but Knight and Hale has developed the first technological innovation in strikers with the Echotech—a striker developed and designed to improve the sound quality and enhance the realism of ALL friction calls. A patent-pending internal resonator dramatically increases surface contact between the striker and calling surface for more consistent control, and a cleaner and faster surface reaction creates more precise and natural tones. This internal resonator is the secret to the Echotech’s diverse ability to enhance the sounds of friction calls. 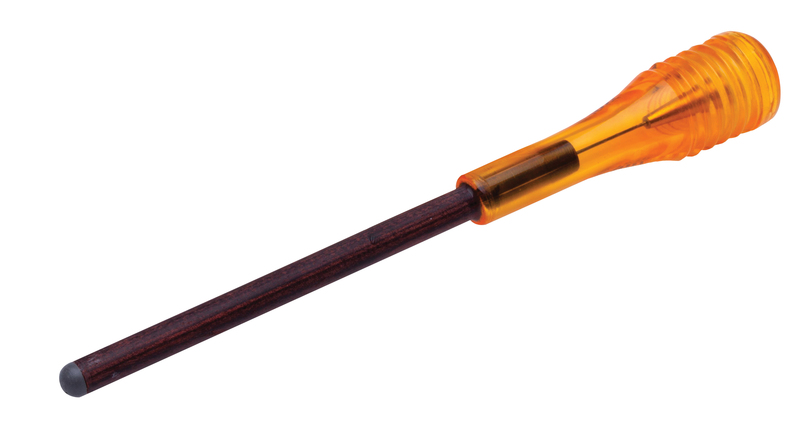 The Echotech works on all glass, crystal, slate, aluminum, and ceramic callings surfaces and features a waterproof tip that works well in all weather conditions. All this, combined with a sturdy and attractive diamond-wood construction, makes the Echotech the ideal striker to help new and experienced callers produce strut-inducing sounds from their friction calls. The MSRP for the Echotech is $14.99. For more information about The Echotech or other Knight & Hale products, contact Glenn Walker at [email protected] or visit www.knightandhale.com. With a product line that includes turkey, waterfowl, deer, predator, small game and big game, Knight & Hale calls have been in every corner of North America. Likewise, numerous world champion callers have been crowned with the help of a Knight & Hale call. Whether it’s a friction call or bugle—or it produces a grunt or a yelp—every Knight & Hale call comes with real hunting experience, as if it’s molded into the construction. It’s those practical insights that guide product development … and hunter success.